You either love or hate John Green. There’s just no other way around it. 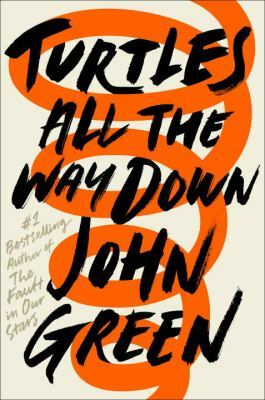 I’m firmly in the ‘love John Green’ camp and as a result, I had been anxiously awaiting the release of his newest book, Turtles All the Way Down. He spent a good chunk of time writing this book and when press started to talk about it, I knew I would relate to the character. Sixteen-year-old Aza has a lot going on in her life. The father of one of her childhood friends has disappeared. That would generate fuss in the community anyway, but add in the fact that the disappeared parent is a fugitive from the law and the craziness begins to snowball. Russell Pickett is a fugitive billionaire and has completely disappeared leaving the community and, more importantly, his two orphaned sons wondering where he is. When a $100,000 reward is offered, Aza and her best friend, Daisy, decide to try to figure out what happened to him. Aza used to be friends with Russell Pickett’s son, Davis, something that Daisy decides is a good omen. Aza is left to try to bridge the gap between herself and Davis. Aza finds herself doing a lot of trying in life now. Her father died when she was younger, leaving Aza and her mom to try to cope without him. Aza is trying to be so many different things that she feels like she has lost sight of who her real self is. She is trying to be a good friend, a good student, a good daughter, but her mind never lets her be. Aza is contantly caught in a spiral of her own thoughts that gets tighter and tighter the more she tries to ignore it. Until she acknowledges these thoughts, Aza’s mind and body control her. She can’t escape. The distraction that the disappearance of Russell Pickett provides gives Aza a new escape and reintroduces herself to his son, Davis. Aza, Davis, and Daisy form a complicated friend group and Aza spends a great deal of time worrying over herself. Turtles All the Way Down is a fascinating glimpse into the life of a teenager trying to make it through life. Aza is constantly battling the voices in her head and the spiral that threatens to overwhelm her. She knows that what she is told to do in her mind is usually wrong, but unless she listens, Aza knows she will be unable to function. This book looks deeply into mental health, resilience, the power of all types of friendship, and how love tries to reach us all. Give it a read and let me know what you think.